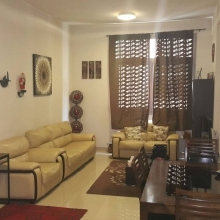 The BRIDGESTREET NAJMA DOWNTOWN is a Tourist, Family Style, City apartment, Full Service property. Located in City Centre area. Shopping is within walking distance and the nightlife/restaurants are easily accessible by taxi or bus from the property. Pleasant city apartments chosen to be located within walking distance from any utilities travelers could need within his extended stay. The apartments have been furnished with well equipments in order to cater exclusively the corporate travelers for their short and long term stay with the best and the latest amenities.